Appearing as a huddled mass lining the rooftops, their solitary brethren roam the alleyways and sidewalks. For the city dweller, pigeons found in one or both of these states are probably not an uncommon, though certainly still unseemly, sight. Verging on being urban chameleons, these dreary scavengers approximate the color of tarnished steel and sullied concrete, their voracious appetites causing them to regularly undertake fearless actions. While not strictly an urban phenomenon, that is the setting our mind’s eye surely envisions them in first and foremost. 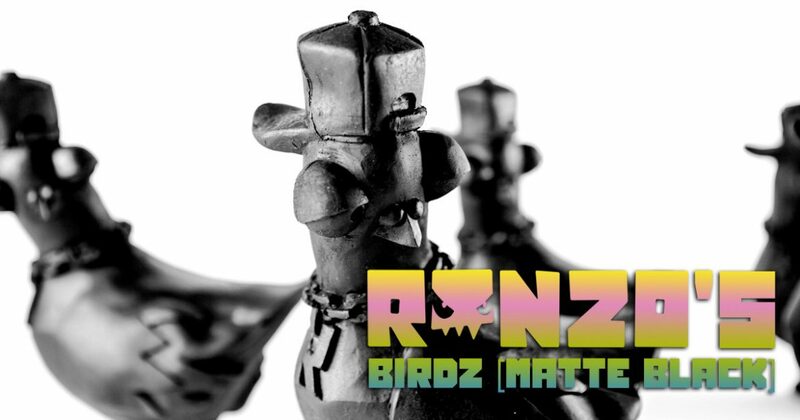 And as staples of the inner-city lifestyle, it only seems fitting that pigeons should evolve to emulate the people around them, which is perhaps part of the inspiration behind Ronzo‘s Birdz creations, interpretations of the avian fiends decked out in b-boy bling. In mid-2011, cartoonish birds began appearing on the streets of East London, their painted appearances augmented by word balloons proclaiming “Tasty” or “Fresh” or the like. Sometimes done as stand-alone works by their creator, Ronzo, and other times being his contribution to collaborations with the likes of Malarky, Dscreet, and Conor Harrington, the one true constant was the polyp of poop issuing forth from their buttholes. And perhaps the most notable appearance of this concept was in the following April when a city preparing for the 2012 Summer Olympics became home to a new Ronzo painting, one depicting his pigeon character defecating on the international sporting competition’s iconic Rings symbol. But this attention-grabbing Olympic Bird (aka Going For Gold) design wasn’t all 2012 had in store for Ronzo’s creation, as these Birdz also made the leap from the two-dimensional to sculptural. Decked out in its fat-laced sneakers, full-bodied baseball cap, and gratuitous gold chain necklace, Ronzo’s handmade Birdz sculptures began popping up on London’s Brick Lane and nearby council estates in 2012. Appearing in both a hand-painted, multi-colored wash as well as an urban camouflaged concrete hue, the invasion of these subversive avians would steadily spread outwards thereafter, such as the installation of one during the artist’s visit to Colombia in February of 2014. And while these were primarily created as sculptural street art pieces to be enjoyed by perceptive people, a small number have surfaced over the years through galleries and other institutions, such as at 2013’s Roll Over Play Dead exhibition, as well as from the artist himself directly. The most recent iteration, the Matt Black (MOAH) Edition, is a limited issuing of one-hundred signed and numbered Birdz sculptures to coincide with the Lancaster Museum of Art and History‘s The New Vanguard II exhibition, an extensive presentation of work from the New Contemporary movement as curated by Los Angeles’ Thinkspace Projects. With each of these roughly 10-inch tall faux-feathered hoodlums cast in polyurethane resin and finished with matte black spray paint, one might expect this dark coloration to obfuscate the sculptural details but these Birdz maintain their sharp aesthetic, much like the artistic voice that conceived them. Ronzo’s Birdz (Matt Black MOAH Edition) pieces are part of The New Vanguard II exhibition, a group showcase which had its opening reception on Saturday, October 20th from 6-10pm with all works remaining on display until December 30th, 2018 at the Lancaster Museum of Art and History‘s physical location (665 W. Lancaster Blvd,Lancaster, CA 93534). Click here to acquire Birdz (Matt Black MOAH Edition) pieces directly from the artist.